Our collection of contemporary photographs of Nuremberg intends to appeal not only to the interested fellow citizen, but also to the welcome tourist considering a visit to the metropolis of Middle Franconia. 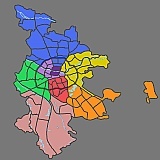 Besides the magnificent sights of the old town, this photo album documents the complete urban area with its 87 districts. Nuremberg, which looks back on nearly thousand years of history, is the second largest town of Bavaria and currently boasts about half a million inhabitants. In the Middle Ages widely popular as the “kingdoms treasury” and now the “secret capital” of Franconia, it was nearly completely destroyed in World War II. This tragedy is documented in the photo below. After that, with unbelievable effort and a widely accepted willingness to compromise, a rebuilding-programme lasting several decades was set in motion. Without exception the following photos are black and white. Using this technique the transparency of the wonderful mediaeval fabric, which is always in the foreground of the photos, is shown to its fullest advantage. Furthermore, the occasionally considerable discrepancy between historical and contemporary architecture is softened, which in the case of colour photos could definitely be felt to be disturbing. Black and white photography quite simply gives the observer a more intimate insight into the mighty, centuries embracing history of this city and at the same time makes possible a certain harmony between old and new. Full screens and our free greetings cards (e-cards), however, are also available in colour. The true fascination of this album lies in the fact that the pictures rely on the tradition of vintage plate photography.